Fire up your grill! Get ready for a sumptuous summer feast. These big, juicy pork chops will be flying off the grill in 30 minutes. They will impress your family and could turn your backyard BBQ into the most popular place in the neighborhood to hang out this summer. If you grew up with a family that celebrated annual summer reunions, there was probably at least one big Bar-B-Que. It went on for hours and hours as more people arrived with lots of your favorite side dishes and desserts. By early afternoon, those grills were heated up and soon the smell of smoky steaks, chops and brats had everyone anxiously awaiting meal time. Somebody, maybe your father or one of your uncles was the self-proclaimed family grill master. When those pork chops hit that hot grill, it was time to start choosing your salads, baked beans and whatever else went well with pork because no one could match those chops. Have you ever thought about trying to learn the secrets of your family’s grill master? You may have watched them, tried to pick up their unwritten rules, but somehow, your grilled foods have never turned out as good as your father’s or mother’s. Wouldn’t it be great to be able to recreate one of those special summer holiday meals at home? Really, it doesn’t matter if the sun is blazing outside or if there is a blizzard blowing through your hometown, you can still provide juicy pork chops for your family and friends tonight. Maybe you are the grill master of your family. Well, this recipe just might make you the undisputed king or queen for generations to come. Or perhaps you like to grill. Sometimes the meat turns out juicy and full of great flavor, but other times you end up with something almost too tough to cut or chew. You’re sorry you wasted the money. Here is your chance to try a recipe that will make sure you get it right every time. 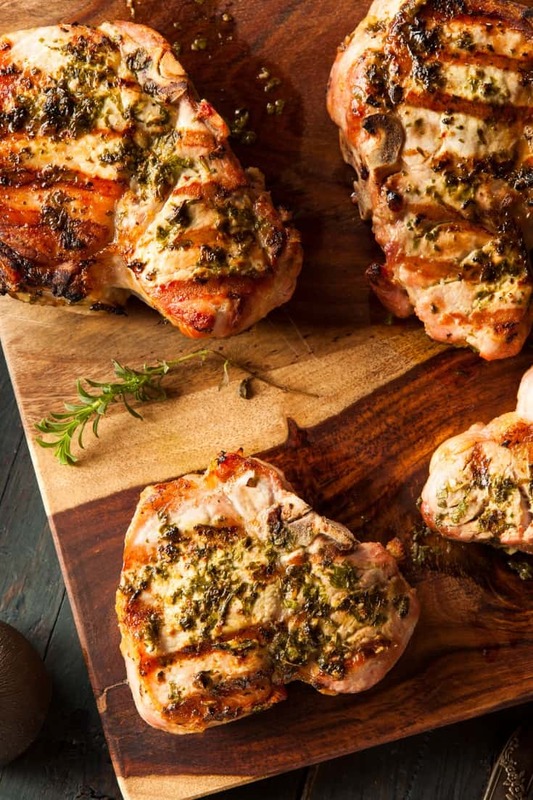 If you are never quite sure how your pork chops are going to turn out because you rarely, if ever, attempt grilling, this recipe might turn you into an overnight pro. This is your time to step up to the plate (or the grill) and show your family just how amazing a grilled pork chop can taste. When you go shopping for your pork chops, it’s good to keep a few things in mind. If possible, go to a butcher’s shop or the meat department in your grocery store. Your butcher will be able to cut the chops exactly as you would like them and can probably give you a lot of hints about his favorite cuts and how he grills them. Either ask the butcher or look for the thicker cuts of meat. The greater thickness will help to keep the meat from drying out while it’s on the flames. Ask for chops that are at least 1 to 1½ inches thick. 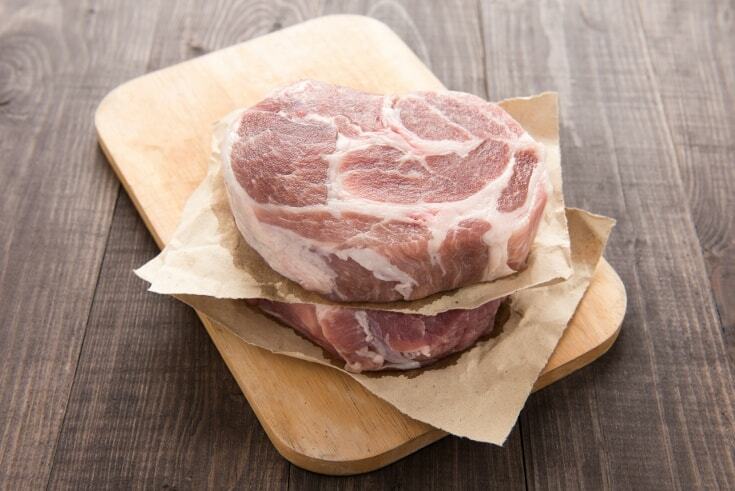 Bone-in pork chops will also retain more moisture during the grilling process. Any variety of chop that you buy should be pinkish-red in color and have some marbling in the meat. Remember that the fat adds a lot of flavor so try not to have all of it removed. Take your meat home and get it into the refrigerator as soon as possible. It can be stored there for two to three days. However, if you know that you won’t be grilling for more than three days, the chops should be frozen. They can be safely stored in the freezer for up to six months. One option to the marinade recipe we have listed in this article is a simple brine. Dissolve the salt in the water; stir well. Put the pork chops in a shallow container then pour the brine over the meat. Add your choice of herbs and spices to the brine and cover. Allow it to sit for between 15 minutes up to two hours. If you will brine it for longer than 30 minutes, place it in the refrigerator. When you’re ready to grill, drain the brine from the pork chops. Pat them dry with a paper towel. Follow the grilling instructions below. Another option is applying a dry rub to the meat before grilling. Prepare the dry rub one to eight hours before you will grill your pork chops. Mix all of the dry ingredients in a bowl and cover each chop with the mixture. Put the chops in a large, resealable food storage bag and place in the refrigerator. When you’re ready to start grilling, take the pork chops out of the fridge and allow them to sit, still covered, for 20 minutes. Spray them with vegetable oil and place directly on the medium-hot grill. 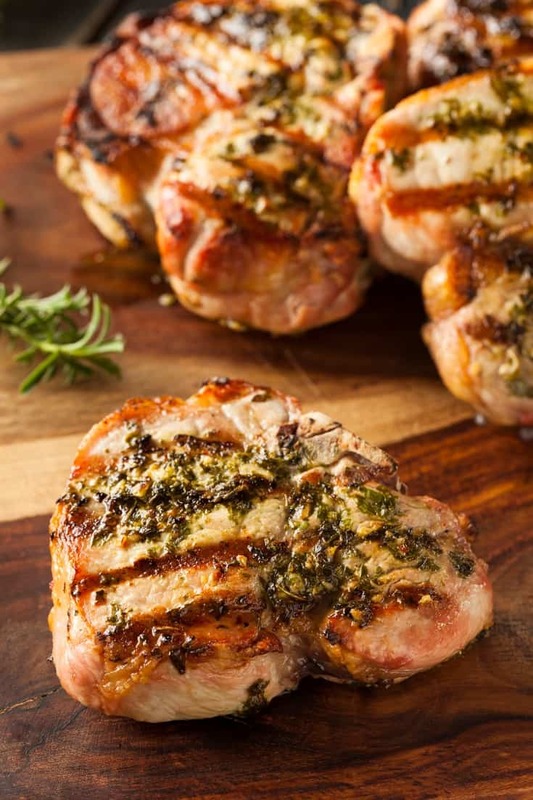 This super delicious and easy to prepare thick pork chops is flavorful and juicy that your whole family and friends will enjoy! Begin by putting the first eight ingredients in a large bowl or pan and blend them together well. Add pork chops to the bowl, turn then once or twice to make sure each one is completely coated by the mixture. Cover the bowl and place in the refrigerate for eight hours or overnight. 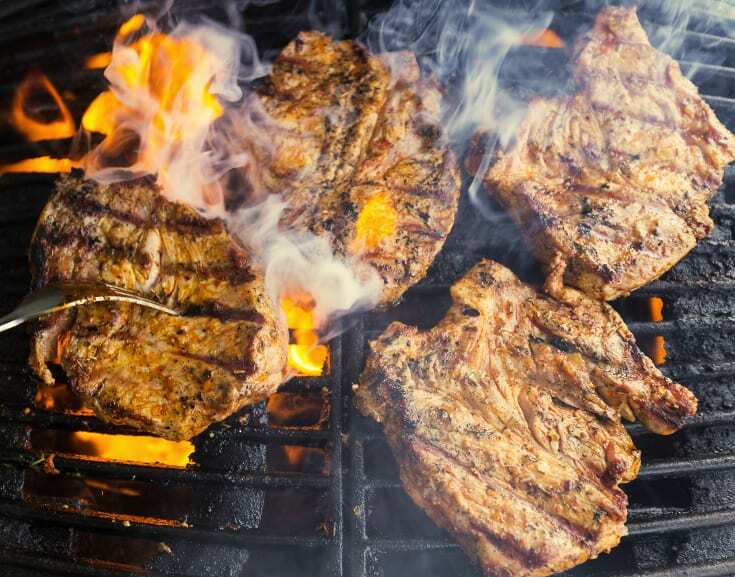 When you're ready to cook, get the grill set up and, if using charcoal, light the fire to let the charcoal reach a medium high temperature and remove the pork chops from the marinade. Drain and discard the excess marinade. You can rinse the meat if you would like to remove any excess salt from the pork chops. However, leaving the marinade on will give your meat a nice, caramelized glaze. Place the chops onto a medium hot grill and close the lid. Let them cook for 10 to 15 minutes then flip them over, cooking them for another 10-15 minutes of the other side. Check the thickest one with an instant meat thermometer while it's still on the grill. The pork chops are done when the temperature reaches 145°F.